Apartments "Kastytis" is a new two-room (54 sq.m.) apartment in the Vanagupė House in Palanga. Here you would find everything needed for your rest - the irreproachably furnished living room, kitchen and separate bedroom with all needed furniture and equipment. All that would ensure comfortable rest for four to five persons. 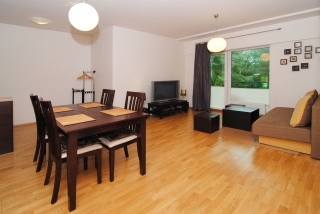 The apartment is 10 to 12 minutes of a pleasant walk to the sea along the pine forest. For your convenience there is a storage room on the ground floor when you can safely keep your bicycles and other stuff. The house has a video surveillance system and the territory may be accessed only by its residents. Attention! If you book the apartment for a longer period, we will offer you a discount!